If you were to ask someone in Glasgow to recommend a good place for takeaway food, chances are that they’ll mention a few of the best spots in the city for a curry. Glasgow loves takeaway; however, one thing we’re not really known for is American BBQ or a good fast food takeaway burger. That looks set to change, as Buddy’s BBQ, which is not even two weeks old, is already receiving rave reviews and feedback on their Facebook page and have even had to close early on a couple of occasions during their first week of business due to completely running out of stock following unexpected high demand for the food. We thought we’d venture over to Shawlands to check it out for ourselves. 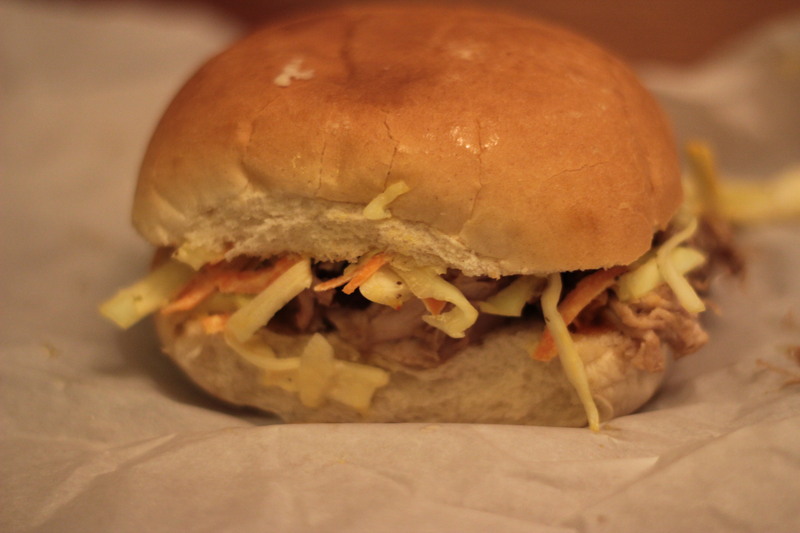 Located on the extremely narrow Skirving Street in the Southside, Buddy’s BBQ, from the outside, is a little unassuming takeaway, almost hole-in-the-wall sized spot. When we visited, it was fairly quiet; however, I can’t imagine more than six or seven people inside at any one time. It’s certainly compact, but if the food is good, the size of the venue is irrelevant. There’s no seating here – takeaway only. 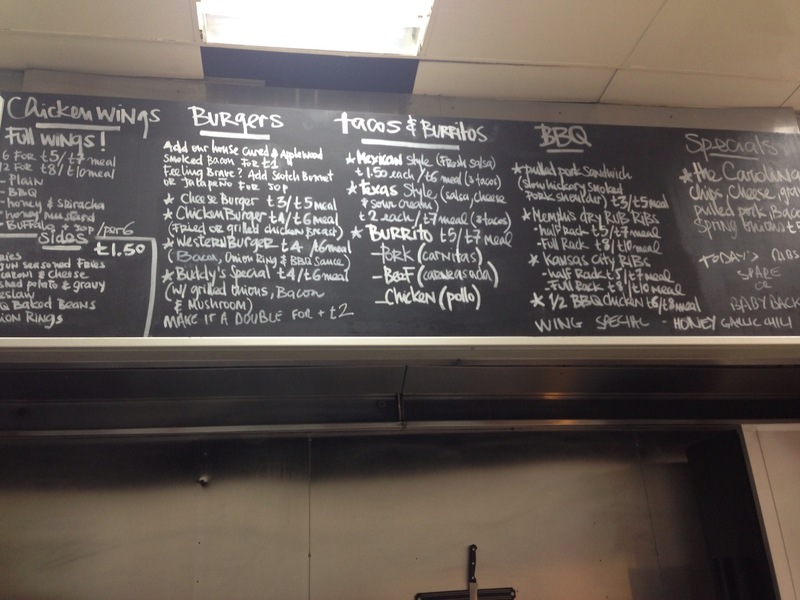 As soon as we walked inside, the first thing we spotted was a rather large BBQ smoker, obviously used for a lot of the pulled pork dishes advertised on the handwritten wall menu! 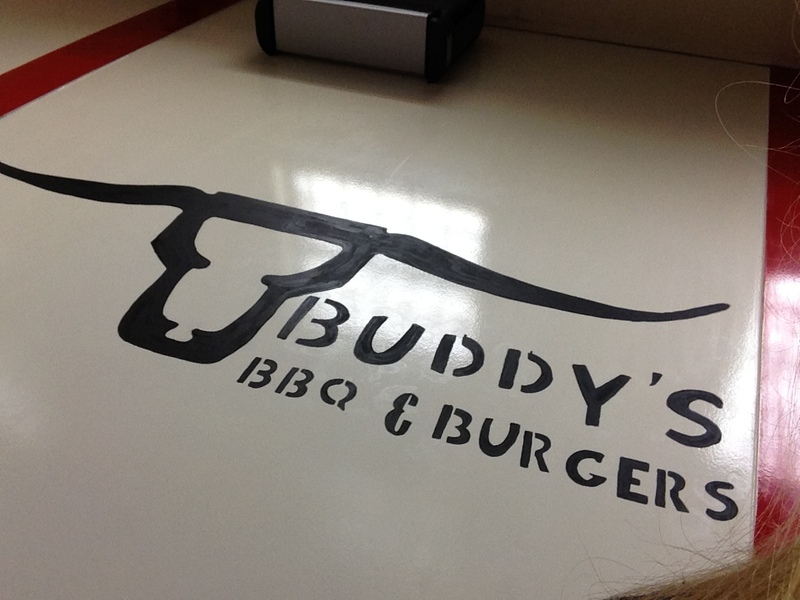 We had a quick look at the menu and decided to try out the Buddy’s Special Burger and a pulled pork sandwich. 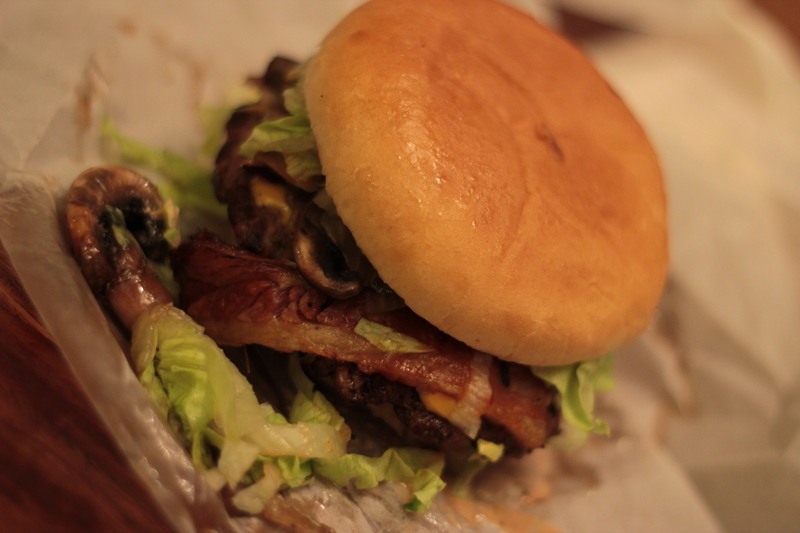 The Buddy’s Special Burger consists of a thin, grill-pressed handmade beef patty topped with grilled onions, mushrooms and cured applewood smoked bacon on a lightly toasted bun. I noticed on the menu that the bacon is also cured in-house, which was a plus. I asked for cheese on my burger also just to finish it off. There were several burger options available on the menu. The burger on it’s own came in at only £4 or you could add any side from the menu for £6 – a pretty good deal in my opnion. I went for the meal option and added cajun fries to my order. As we waited for the food, Buddy himself greeted us and the other customers who walked in. I loved the fact that I was able to see my burger being made from scratch, from watching the fresh patty being thin-pressed by hand on the grill to each topping being added one after another and the finished burger put together. It certainly makes for a nice change to the takeaway burgers that you’d usually find in Glasgow, which are normally bought in bulk and pre-frozen prior to being sold. As the food was cooking, the smells began to send my hunger almost out of control as I stood at the counter, reading the menu over and over. I asked for some sweet BBQ dressing along with some of ‘Buddy’s secret recipe sauce’ to top off the burger and had the pulled pork sandwich topped with some spicy mustard. We got our food, paid and quickly headed home to eat. Inside the Special Burger. Proper fast food! Let’s clear up one thing – if you are expecting restaurant-quality gourmet food or the type of burgers you’d find in a good quality city-center bar then this probably isn’t the place for you – but that isn’t a bad thing! 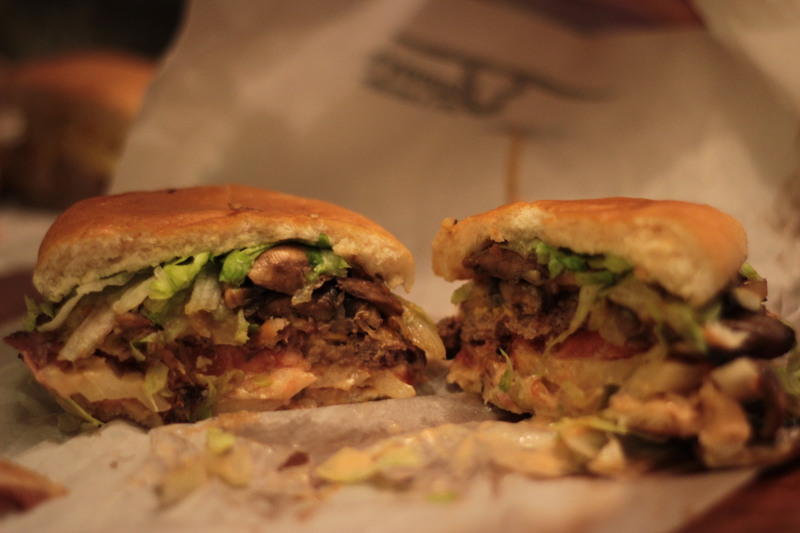 Buddy’s focuses on tasty, good quality, low-cost fast food. The presentation of the burger was nice and mouth-wateringly messy, with the secret recipe sauce and cheese spilling out of the sides and covering the thin, hand pressed beef. I looked at it and thought ‘good quality fast food’ and that is exactly what it is. Even Buddy himself mentioned a nearby restaurant as we waited for our food, saying that they served up the best burger he’d had in Glasgow and said that the types of burgers he wants to focus on is authentic American, fresh fast-food. So how did it taste? I’m happy to report that good American fast food has finally landed in Glasgow. 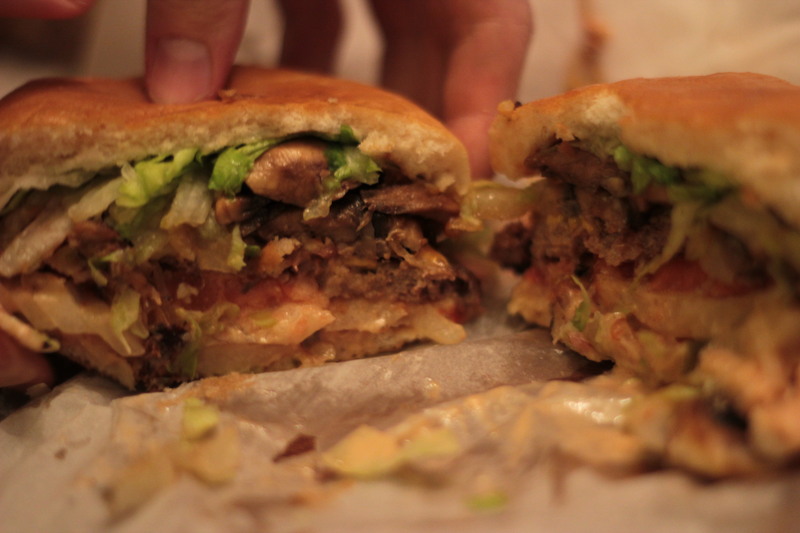 It simply tasted like a fast food burger, but much better to what we’re used to in the city and surrounding areas. The bun was nicely toasted and no-frills and the grilled mushrooms were delicious. The cheese was nicely melted and messy and I got a nice sweet kick from the BBQ sauce. I’m not sure what was in Buddy’s secret recipe sauce, but it complimented the sweet BBQ with a nice intense kick to finish off the burger. It wasn’t the biggest burger in the world, but for the price, you won’t get bigger or as freshly made good fast food in Glasgow. My hands were covered in BBQ sauce and cheese by the time I had finished and typing this review, I can still smell the food on my hands from just over an hour ago and it’s making me want more. The pulled pork sandwich came served on a standard roll, that perhaps I would have changed, simply because it was too similar to the burger bun that we had just eaten. I felt that it would have good to differentiate between the two dishes presentation-wise a little more. I also felt that the bun that was used didn’t quite fit or compliment the pulled pork. Made from a slow, hickory smoked pork shoulder, the pork just about melted apart in my mouth with each bite and the salad and spicy mustard toppings were a nice addition. Much like the burger, it wasn’t the biggest sandwich in the world, but for only £3, I don’t know who is going to complain. Buddy had mentioned to one of the other customers present at the time that he had been awake all night slow cooking the pork and it certainly came across in the taste. If the roll/bread had been different, it would have been even better and probably would have added a bit more to the overall taste. 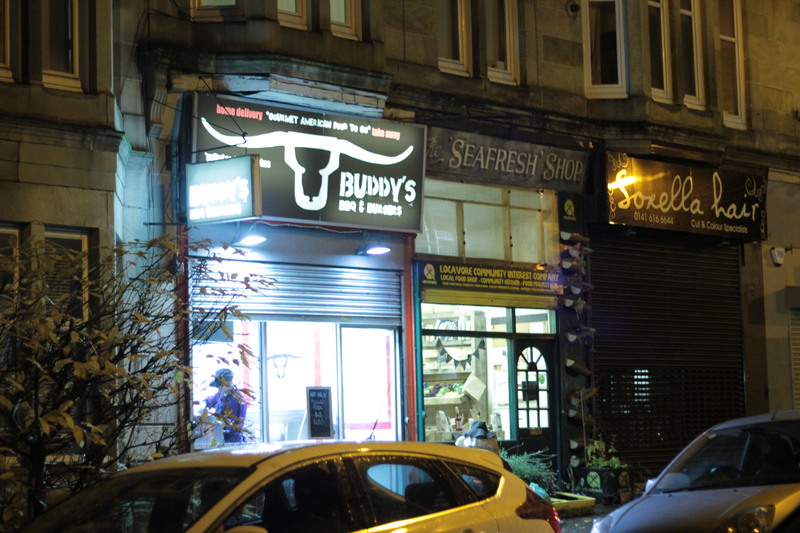 Buddy’s BBQ gives Glasgow’s takeaway scene a nice breath of fresh air and is a welcome change to the usual sea of curry houses and kebab shops that, although serve up tasty food, usually offer nothing new that we haven’t seen before. 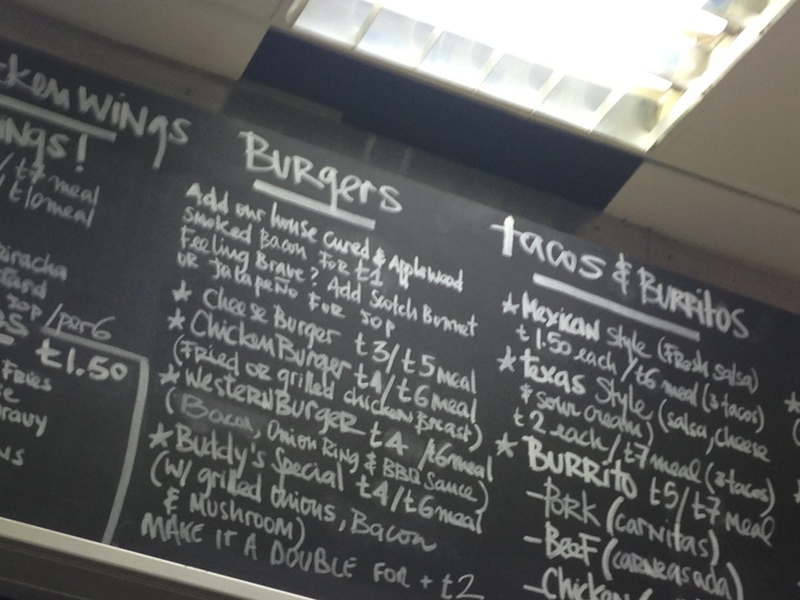 Buddy’s menu is creative and has a very South-American flavour and it’s clear that the owners are passionate about what they do. As we waited for our food, we heard them talk about the much-loved Man vs. Food TV show, different sauces that they wanted to try out on their food and several popular American food blogs. 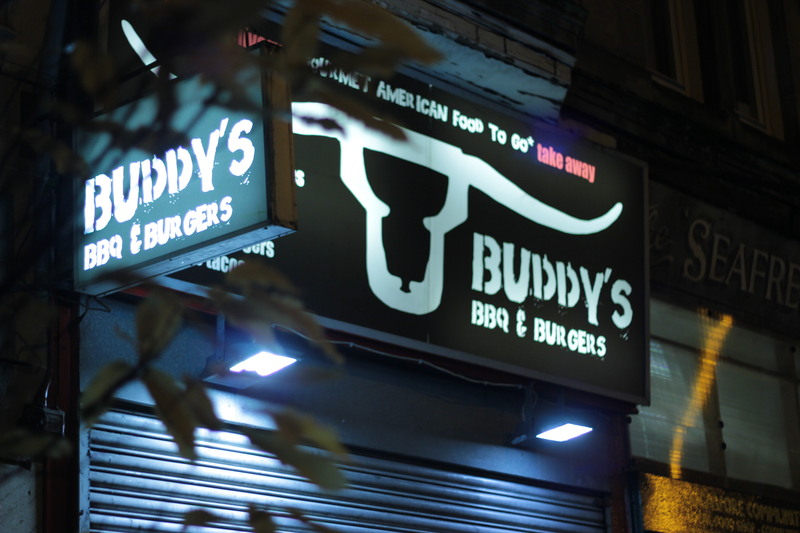 We can also see Buddy’s becoming very popular with students in the nearby area, with it being wallet-friendly but still offering good quality fast food. Despite still being in it’s infancy, the takeaway’s popularity is already quickly growing and if they can keep up the level of creativity that they are currently putting out, they certainly have the potential to thrive in Glasgow. On their Facebook page, Buddy’s has mentioned that from next week (November 21st), their landline is being fitted (we’ll add the number when it is available) and they will begin offering home deliveries – something that is sure to make it even more popular with Southside residents. We didn’t wait long for our food and the service was friendly and quick, although we’ll no doubt make a return trip when it’s slightly busier too. As we mentioned before, if you are after gourmet burgers then booking a table at a nearby restaurant is probably a better option. If you are looking for freshly made, good quality fast food in Glasgow that offers something new and a welcome change from your standard Mc-Chain, get yourself along to Buddy’s. Price: Burger £4 or £6 with any side / Pulled Pork Sandwich £3 or £5 with any side. 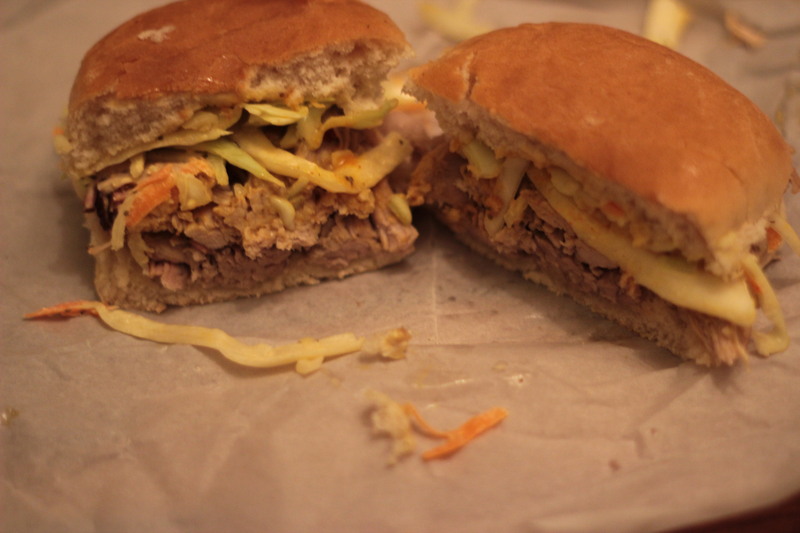 – Pulled Pork sandwich, whilst good, would have worked even better on different bread. Went to buddys the day it opened, (work in Biscuit cafe at the top end of Skirving street), have between craving some some American bbq since my trip to Seattle last year, was not disappointed, got the full rack of ribs with some hot sauce! Amazing, going back tomorrow for lunch to try the pulled pork!! Can’t wait!! I came here on Wednesday with very high expectations, and although the burger my girlfriend had was really nice, and the chips really crunchy and fluffy, the onion rings and the burrito left a lot to be desired. I’m glad it looks like it’s getting better, only living round the corner from this place I hope it does well. What a lovely review! The popularity of this place is just incredible. The pulled pork is always put of this world and Buddy works hard throughout the night to ensure it is BBQ’d to perfection. The Carolina is probably meant for two to share but can easily be munched by one person, and the gravy is to die for. So proud of you Buddy! The pork’s gorgeous, but the mustard sauce at least needs to give some ground to other options. An NC style vinegar sauce would go over well with briny palettes (especially because the slaw-on-sandwich is traditionally NC), and a memphis/alabama tomato based sauce, with a brace of that [typically virginian] mustard wouldn’t be bad either. Thank you for staying away from the sweet texas/st louis cliches though, there’s too much of that already. Also, ditto on the redundant bread. Don’t be afraid to serve it between two slabs of white bread; it’s the way it always shows up back home, and we haven’t complained for a century or so. really really good food. best takeaway in Glasgow is go ao far to say l. need to sort out service though. I have passed every Saturday since it opened,I seen the queue’s to get food (but never went in). I passed again today(big queue again) but this time on the way back I went in and got the pulled pork roll……….WOW !!!!! It was great,and I will be back for the ribs and pulled pork next week !!!!! Pingback: What's On: Glasgow South Side Beer Festival - Get Out Glasgow! I’m intrigued – Buddy said he’d had one of the best burgers ever at a nearby Southside restaurant. Name names?! Where was it? I like iit when people come toether and share thoughts. and what you will accept because your company logo. of users downloading torrents every day. What’s up, yes this paragraph is in fact fastidious and I have learned lot of things from it regarding blogging.